A couple of months ago, I received a free sample of Clinique's Even Better Make up SPF15, in an issue of Psychologies Magazine. I've had sachets of this stuff before, but from past experience they never seem to be the right shade for my skin, so I typically don't bother. However, during a tidy-up this afternoon, I came across the sachet and since it was a "neutral" shade, I decided to give it a try to see what it was like. Clinique and Me: I have honestly never tried any product by Clinique. From experience, in my local Boots, the staff can be incredibly pushy and if anything is going to put me off, that will always be number one. I can not stand pushy staff. If I want to buy something then I will. The second thing that puts me off Clinique, is the price. At £21 for a full-size bottle of this product, I can't help thinking that it's a little bit expensive. I mean, what makes Clinique any better than other cheaper brands? But, I think the price issue, was part of the reason why I decided to try it out. I wanted to discover if it really was worth the money. I know one use isn't that great of a trial, but it's the only option I had. Make Up SPF 15 evens and corrects. Tests: Dermatologist tested. Allergy tested. 100% Fragrance Free. My Skin: Naturally, I have really oily skin, which is of course still the case, however, I noticed when I applied a mineral foundation the other day, that my skin appears to have become really dry around the top of my nose and forehead area, so I figured that trying a product that was for combination oily skin would be a great thing. 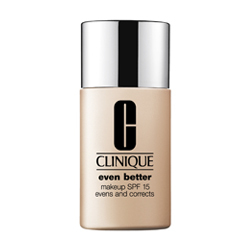 "New Even Better Foundation SPF15 oil free formula, a powerful foundation developed to help combat hyper-pigmentation and deliver brighter skin, both immediately and over time. Includes treatment benefits to help even skin tone and SPF protection to help prevent future hyper-pigmentation. Provides moderate to full coverage, leaving skin instantly perfected with a unique mineral blend." Initially, when I squished the product out of the sachet, into my hand, I didn't think that there was enough product, but when Clinique say that this is a full coverage product, they do actually mean it. It really did not take much to hide everything on my face, from the spot on my skin, to my red cheeks, including the bumps I have in that area and even a tiny mole! So for coverage, it most definitely gets full marks. Admittedly, the shade was completely wrong for my skin tone, but although I'm still slightly useless in some areas of make up, I did manage to remember to blend it into my neck and such, so it didn't look too bad. The skin did kind of make my skin look bright, but to be honest, I think that was more shine than anything else. So, I'm really surprised to see that this is an oil free formula, but it certainly didn't look oil free on my face. Maybe, I'm just used to matte foundations, or maybe it's just my greasy skin (highly likely), but this really didn't look too great. It didn't feel that great either. Whilst the product didn't feel as heavy as some do, it really did feel like it was just clogging up all of my pores, which is not a good thing for someone with oily skin, that is prone to breakouts. Despite feeling a little heavy, and looking a little too shiny for my likings, it did last quite well throughout the rest of the day, well except for my biggest problem area which was my cheeks, where the redness has really come through. And, this definitely wasn't down to me touching my face (that I'm aware of). Shades: There is a HUGE selection of shades, so I'm fairly sure that if I tried hard enough, I'd probably be able to find one that was better suited, but Neutral is not the one for me! Price: At £21 this is an expensive product, for most people. I would like to say that you're paying for good coverage, but it just didn't stay put on my cheeks, which for me, is a really big deal. Who should avoid this product: Anyone with really problematic skin, because although it does offer full coverage, it doesn't necessarily last in the most-needed places, and to be fair, my cheeks aren't even that bad these days. I also wouldn't recommend this particular product to anyone with oily skin. I definitely will not be buying this, but I'm really glad that I tried it, because at least I now know, that although a lot of people love it, it's not for my skin.